For almost fifty years, the National Championship Air Races, the fastest, most prestigious air races in the world, have been held each September in front of thousands of spectators in Reno, Nevada. In this 5-day event, pilots compete in various categories in courses marked out on the ground by pylons. To win at Reno, it's simple: Fly Low. Go Fast. Turn Left. 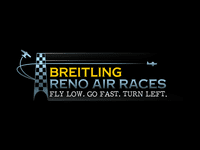 As the event's main sponsor, Breitling has created the Breitling Reno Air Races game. Designed for anyone with an iPhone, iPad or iPod, or any mobile device running Android (available as of September 2011), the game lets you discover and enjoy the thrilling races at Reno. Take control of the plane of your choice and pit yourself against others in online multiplayer mode, or on your own in solo mode. This is a unique chance to experience what it's like to fly a plane at the Reno Air Races.